For a casually cool outfit, team a Doo.Ri Long Sleeve Cardigan with black leather leggings — these pieces fit really great together. A pair of tan leopard suede pumps immediately amps up the chic factor of your outfit. Why not marry a burgundy open cardigan with an orange casual dress? As well as super comfortable, both of these pieces look stunning when worn together. A pair of brown leather pumps instantly revs up the wow factor of any outfit. Wear a Doo.Ri Long Sleeve Cardigan from TheRealReal and navy skinny jeans for an everyday outfit that's full of charisma and personality. 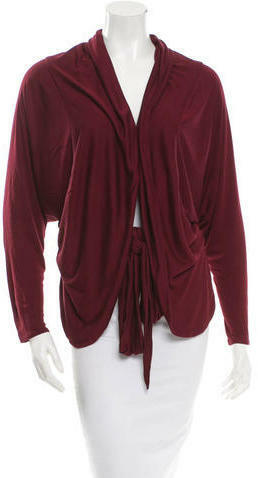 Pair a Doo.Ri burgundy open cardigan with black skinny pants for relaxed dressing with a twist. Make a bit more effort with footwear and complete this outfit with a pair of tan leather pumps. Dress in a burgundy open cardigan and charcoal skinny jeans to don a chic getup. To bring out a sassier side of you, complement this look with dark brown leather lace-up flat boots. This getup with a Doo.Ri Long Sleeve Cardigan and beige tapered pants isn't so hard to score and easy to change. Feeling creative today? Jazz things up by wearing burgundy suede heeled sandals. For an ensemble that offers functionality and fashion, try teaming a burgundy open cardigan with black leather skinny pants. Tan leopard suede pumps are the simplest way to upgrade this outfit. This relaxed casual pairing of a Doo.Ri burgundy open cardigan and burgundy leather skinny pants is perfect when you need to look chic but have zero time. Put a dressier spin on an otherwise everyday look by wearing a pair of burgundy leather pumps.